Go here now! Only a half hour train ride from Paris! 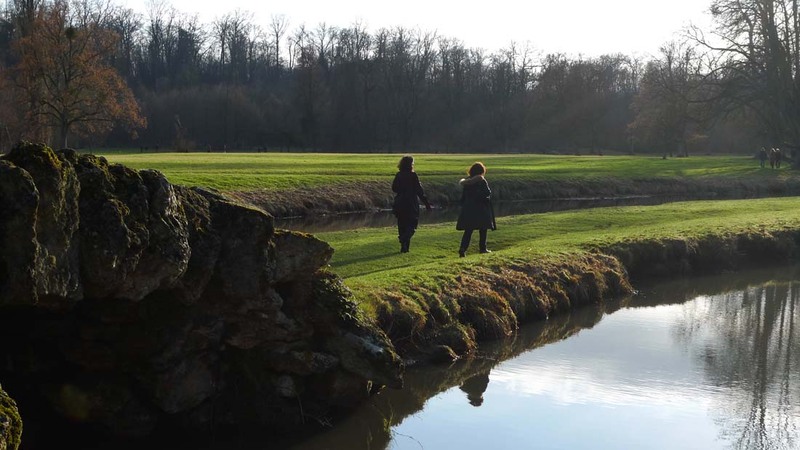 Ten years before Louis XVI and his head parted company in 1793, he bought Château Rombouillet, a vast rural hunting lodge and grounds from his cousin, Duc de Penthièvre, with the hope that his Queen Marie Antoinette would enjoy herself here. Apparently she didn’t, but minus wigs, bustles, and high heels, we managed to feel like royalty as we strolled the spectacular ancient woods accented with charming little bridges, foot trails and bridle paths under a dramatic winter sky. When the Château passed out of royal hands, it became the summer residence of commoners, i.e., Presidents of the Republic. I phoned ahead to make sure Nicolas and Carla were elsewhere, otherwise our fellow tourists would be wearing the GIPN uniform (that’s French Swat team) and sharpshooters would be stationed on the multi-turreted roof. You are not allowed to trudge through the house when the President is here pretending he’s working. When he’s not there, the Château is still a part of the government so the only way to see the interior is a forced march guided tour (with the usual hysterical prohibition against photos). The tour doesn’t take long because although the Château has an impressive palatial facade, the rooms have all the thrill of a slightly dolled up Best Western Hotel. Like our rural American château, Camp David, the furnishings are drawn from strays, facsimiles and rescues scrounged from other state owned properties. When Louis breathed his last, the original Rombouillet furniture was redistributed (read: looted and auctioned) to pay for a new government. 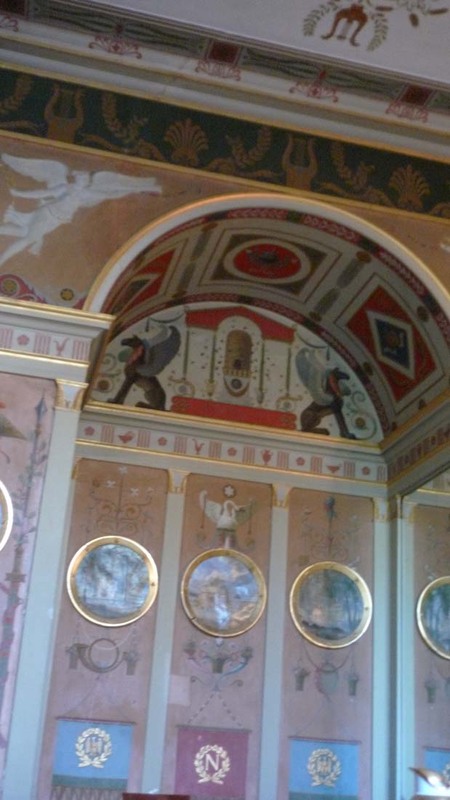 There are few authentic rooms left, and a few historic post-Louis rooms like the quaint Roman villa style bathroom frequented by Napoleon. 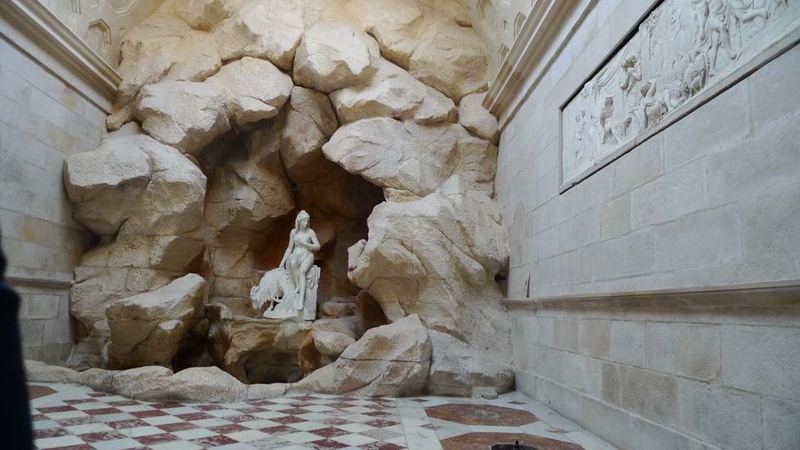 Legend has it he took his last bath here (under guard) on his way to exile in Elba. 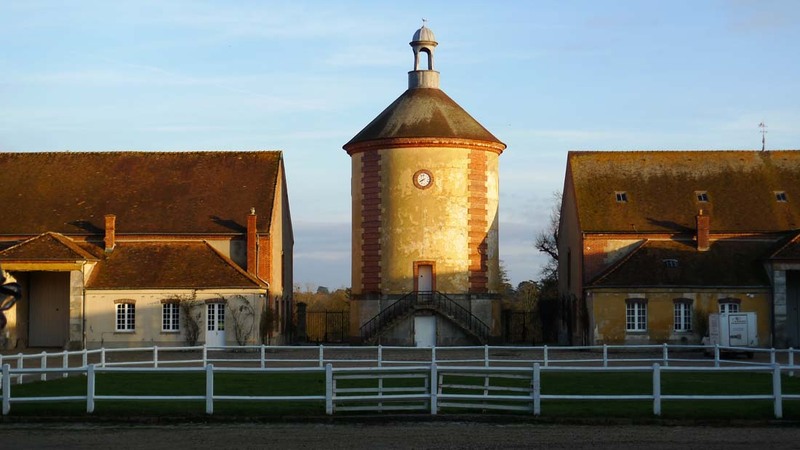 Since Marie Antoinette found Rombouillet rather boring, Louis XVI built her the little round La Laiterie de la Reine (the Queen’s Dairy) out in the fields as an amusement. It is a miniature milking barn of sorts, built in pristine stone with marble floors, classical style sculpture depicting frolicking nymphs and putti cavorting with goats and cows. There is even a charming little nymphaeum attached. Still, it’s hard to imagine Marie Antoinette sitting here on a three legged stool, yanking on a cow udder in giddy delight. Seems like this place is more about Louis than Marie. 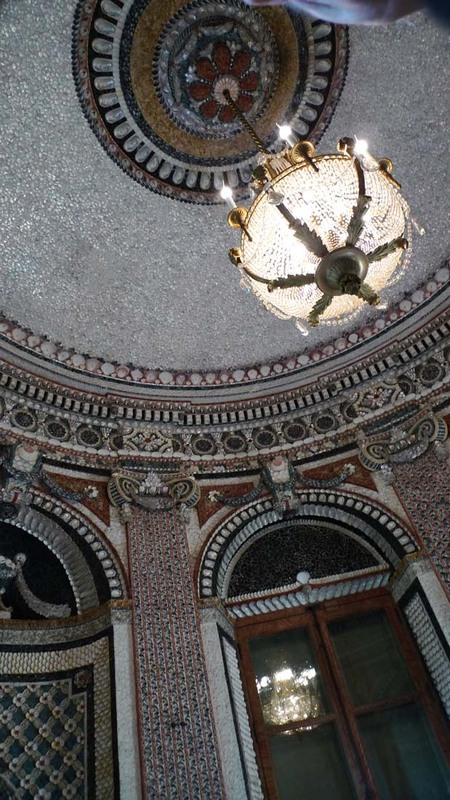 For us, it is a precious little architectural gem not to be missed. 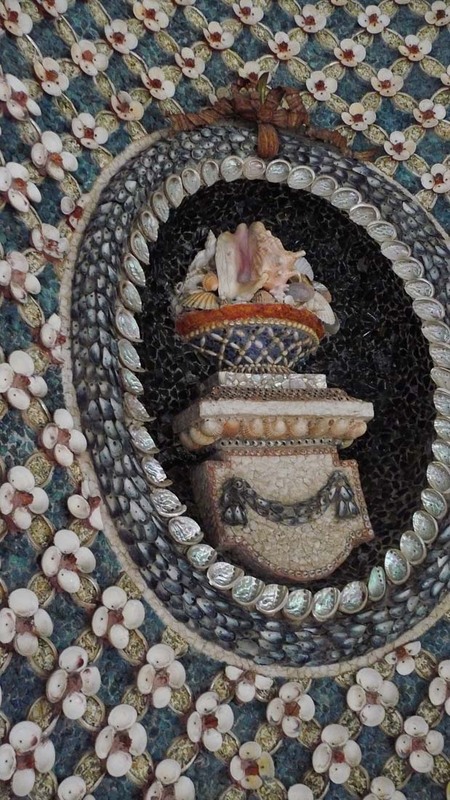 Our primary inspiration for visiting Rombouillet was to see La Chamière aux Coquillages. This petite shell cottage (also set in a pasture) was originally designed for Princess de Lamballe before Louis owned the property. During the French Revolution, the Paris mobs rewarded the poor Princess’s loyal friendship to Marie Antoinette and Louis by skewering her head on a spike. I’m not a royalist or anything, I’m just saying…the cottage still looks like a lovely place to have your servants bring you tea, and give you a bath while you gaze lovingly out the window at Daisy, Bessie and Bossy. Note: take a second look at Sofia Coppola’s 2006 Marie Antoinette starring Kristin Dunst and the 1938 Marie Antoinette, starring Norma Shearer. Look for Princess de Lamballe, she’s the best friend. 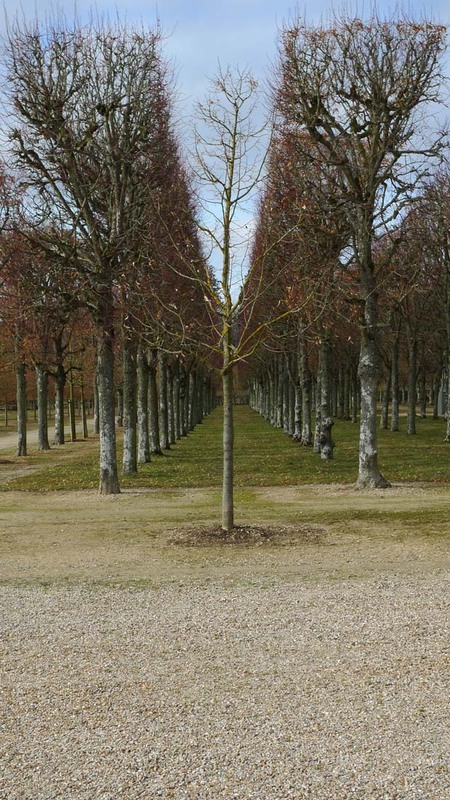 Whatever Louis XVI’s failings, and they were enough to cause a revolution, honestly, he had only the best intentions here at Rombouillet. Here is the good Louis, a guy who simply wanted to get back to nature. He transformed this hunting château into an experimental farm in a way that today would have won him a medal from the Slow Food movement. He bought a herd of full wool Spanish Merino sheep, African sheep, Swiss cows and angora goats. Democratically, he encouraged all of them to eat, prosper and pursue as much happiness as their breed would allow. Today, there is a sheep and agricultural school at Rombouillet. Attached to it is La Bergerie, the Sheep Barn, a shop plopped down in the middle of the woods. In winter, a red faced cook made crepes and ladled up local apple cider for the visiting crowd. There was also a long, patient line of people waiting to buy the fat rich products produced by 55 milking cows, 30 meat cows, poultry (particularly enormous quantities of rendered duck fat) goat, rabbit and sheep, all of whom live remorselessly on the property where Louis and Marie Antoinette once frittered away the monarchy. 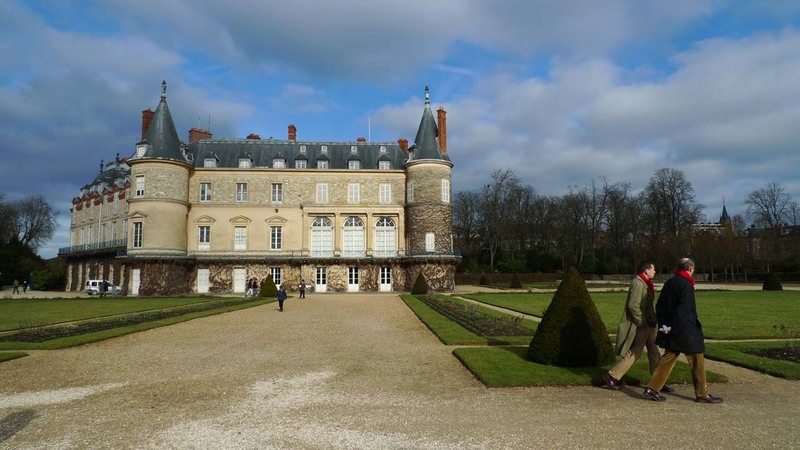 Château Rombouillet is the perfect day trip out of Paris. Only half an hour away by fast train from Gare Montparnasse, it’s an enchanting fairy tale castle and grounds, magical in any season. You can walk there from the train station (about 15 minutes) or take the local bus. There are free maps right there at the local train station. It’s divinely empty in Winter, but lovely any time of year. Restaurants and coffee shops are scattered along the main street on the way to the Château so you are never far from food, albeit, not great food. Make sure President Sarkozy is attending one of Carla’s rock concerts or you will be making the journey in vain. On our country walk back from the Sheep barn we met some friendly Rombouillet villagers who walk their dog in the forest everyday. They turned out be WWII Polish immigrants to France who emphatically claimed they hated Paris, and if they could live anywhere in the world it would be San Diego, California. Once back in Paris you will need a hearty meal to make up for all that fresh air. We love this small neighborhood haunt (no atmosphere whatsoever) with perfectly authentic French food at reasonable prices: Le Bistro des Halles, 15 rue des Halles, 75001 Paris. Tel: 01 42 36 91 69. Duck confit over fried potatoes and mushrooms will put some meat on your bones. Lunch for two with house wine is about $45. For more innovative nouvelle fare in a chic modern atmosphere (with plenty of fish choices), try the lovely MON VIEL AMI 69 Rue St. Louis en L’ile, 75004 Paris. 01 40 46 01 35. Closed Monday and Tuesday. It is on Il St. Louis. Lunch for two, about $65.